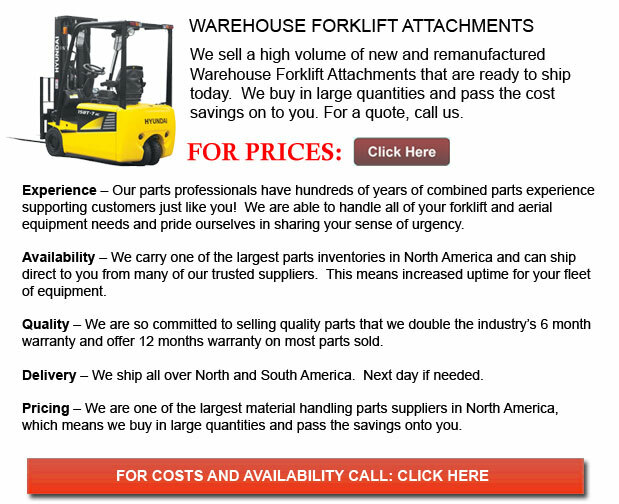 Warehouse Forklift Attachments - Extensively utilized in shipping facilities, the pneumatic forklift or pallet truck, may be utilized to transport resources that are positioned on top of pallets. A pneumatic forklift typically has a set of metallic blades installed on a wheeled counterweight that also has a pump. The pump is used to raise and lower the forks. It is important to visually check the pallet truck prior to loading any materials and to make sure the handles move fluently, the pallet lift turns appropriately, and the lift is free of any would-be obstructions. Check the cargo to make sure that there will be minimal opportunities for anything to drop off during lifting and moving. Release any air in the pump and lower the blades to the floor by squeezing the handle installed on the inside of the metal ring on the end of the handle. Run the blades into the slots in the pallet and ensure the forks are centered so that the pallets' weight is evenly spread. Pump the pneumatic lift handle up and down to raise the forks from the floor. Stop pumping once the pallet is entirely off the floor as there is no need to raise it any higher or risk losing stability while turning. In order to move the pallet, drag the handle behind you; you should not push it. There will be a large amount of momentum existing. Avoid quick or sharp turns and do not stop too swiftly. Gently bring the pallet to a rest wherever you would like to park it. Squeeze the lever inside the grip end to return the forks to the ground. Withdraw the forks from the pallet and return the pallet lift to its chosen parking spot.